In the last post we discussed the importance of Fundamental and Technical Analysis. Now we will see one of the most simple, easy and powerful thing called Support and Resistance. This is for people who have no idea about what is it and have at most heard about it. Let us see both of them one by one. Support for a price is a price area where there are lots of buyers ready to buy the stocks rather than sellers. At that price point, the general perception is that its a good buy, and lots of buyers come to buy it. Hence buyers outnumber sellers and there is a higher possibility that prices will bounce back from that point . This is a point where Buying has less risk. In other words, at support levels demand is thought to be strong enough to prevent the price from declining further. Please understand that Support point is not a place from where it will for sure bounce back, Its only the higher probability that it will bounce back. Also understand that its not exactly a fixed price which should be considered as Support, generally its a range like 98-100 or 560-570 .. Which point is Support point : Every Low made by the price can be considered as Support Area. Support Example 1 : Below chart is for Jaiprakash Associates (click to enlarge), It made a low of Rs.53 (closing price) on 27th Oct 2008 and then bounced up from there. Now Rs.53 is the support point, Prices went up from that point and after reaching Rs.90, it again started heading down, You can clearly see in charts that it reached Rs.53 levels, but could not break down from that point and again bounced back from there. It was a very good “BUY” around Rs.53. Understand that buying around Rs.53, is only a less-risky trade, not a “no-risk” trade. Prices can break down from there also. Below is a chart of RPL. Here you can see that prices made lows of Rs 70 around Dec 1, 08. That became a support point, and then prices reached thought levels around first week of Mar 09, It bounces back from that point, It was a less risk trade around Rs.70. Resistance : Resistance is just opposite of Support, At this price levels there are more sellers than buyers and with high probability prices reverses from this point. At this point there are enough sellers in the market to prevent it from rising further. Resistance point is the High made by a price. All the high’s will act as some kind of resistance points. Below is Reliance Charts, You can see that reliance made a high of Rs.1400 around Dec 2008, After that you can see how it reversed from that point 2 times in Jan and Feb 2009. It was a wise decision to sell at those points. Important Note : When prices are near Support or Resistance levels, you should be more alert. It does not mean that you just jump onto market and buy or sell, Be patient to see the actual price reversal, Though you will loose some part , that would be a better trade. Also there are several other factors which should be considered, but for now lets not touch upon them. lets keep it simple for readers. Always remember that when prices don’t hold support and break them and fall further, it tells that buyers are not strong enough and Sellers have taken over them and prices will make new lows, When support is broken, Sell further. 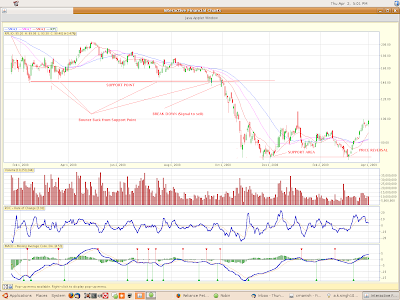 Example : Below is the chart of RPL, which shows how it broke down its support point and then made further lows. When prices don’t hold resistance points and break them on upside, prices then indicate that they are going to make new highs. Better to buy at that point. 1. 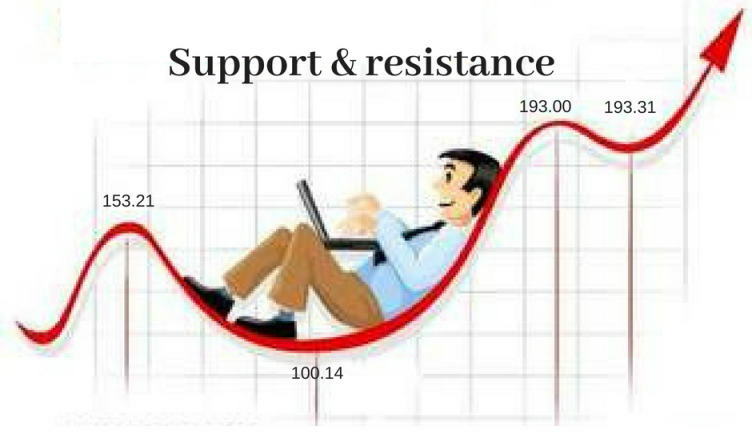 Support and Resistance points are places where you should be more alert and look for other signals to buy or Sell, just don’t buy because prices have reached near support, buy it when it starts rising and there are positive signals. 3. Many times there are false breakout and breakdown, So it will many times happen that you get out at important levels and miss the large movement, that’s fine, you can always enter after getting out. 4. This is most important point, Everything I talked about in this article can increase your chances of making more money in trading, but remember that you are dealing in Markets, and if you don’t control your GREED and emotions, your failure is guaranteed. Use strict Stop losses and use Money management techniques (it means not putting all your money at once, if you have 10 lacs, put only 1 lac, don’t be greedy enough, else someday you markets will punish you badly, then no Technical analysis or any thing will help. have good amount of cash with you always ). All technical Analysis and knowledge are of no help if a person cant control his greed and emotions in Market. TA and your knowledge will contribute not more than 20% of your success in long run. This was end of Part 2 of this series, In next port (Part 3) we will see how to find support and resistance levels using TRENDLINES. wait for it. Comments please, Its sometimes disheartening to see no comments after I put up a post after some hard work. I don’t want “good post or Great Article kind of comments, but at least share what you have learned and ask questions, make it little interactive please. Question 1 : Do you think this support or resistance thing works , or can you add anything else how to buy or sell and what things to observe at support and resistance levels , which can make buying and selling more successful? Question 2 : What do you think about Chambal Fertilizrs at this point , see the charts at : https://www.bazaartrend.com/index.php?symbolname=CHAMBLFERT (click on the upper left button to make it full screen). Suggest what should be done at this point of time ? Note : All the things discussed here are available on net with great detail. learn more of it yourself. Do you know any site through which I can set a trigger for a share so that I get SMS and email alert whenever price of a share increases or decreases beyond a threshold limit? I want to know that if any share is at support level and moves up and someone is buying the stock then what should be SL for this…………….also for resistance. 1-can you show use the relations between indecators and commodities or stocks?i want to know there are arelation or what ? how can measure the market? 2-there are two ways to calculate pivot point to catsh resistance and support. why we caculate 1R 2R AND 3R SAME IN 1S 2S AND 3S? i mean why three excpectations? Which chart ? Give me the link ? Thats made frmo http://www.bazaartrend.com . You can use it for free online . This is now getting very technical , not for commom people , the most easy SL would be to just use SL 2-3 points below the buy price .. like If you buy at 43 , your SL can be around 40 . Understand that it depends on how much you can risk . Other better ways of doing it using ATR . that Average True Range of the stock … You can use 1.5 or 2 times the ATR of the stock … Read your self on this topic . Hope you learnt something !! , Read read read !! .. Learn Learn Learn !! Thanks for the quick response. In case its a false breakout we need to have strict stop loss, right. In this scenario any idea how to calculate the stop loss. Very good . That was perfect analysis . The other points which confirm the analysis are . If you see the length of the channel (previous Support (33) – Resitance (43)) = 10 points . Next Target = Reistance + 10 = 43 + 10 = 53 . So , from this way also we get a target of around 53 . For the second question, from the charts I can see that the chambal fertilizers has broken out its resistance level 42-43 and is moving towards next resistance level which is around 53. In this volatile Market where there is lot of uncertainty can we go and buy this stock thinking it has broken resistance and it will go to 53 or wait for the next cycle, I mean let it go to 53 and once it come down to 43 then buy it. Since it has just broken the resistance and soon after that before reaching 53 if downtrend starts will it find support at 43. Let me know what you think on this. I got it ! I was seeing support and resistance as two seperate entities.I need to study much more to understnad these in real time. And coming to your 2nd question – I can’t see any chart in the link u gave ??! lets first look a new example … suppose a stock support is at 100 , the price have come to this point and often revered back to go up again , suppose next time prices reach near 100 and break them and go below it to reach say Rs 60 . Now 100 which was support earliar will now be resistance point . Reason : Try to imagine a situation when prices were above 100 and coming down near 100 . most of the people know that its a support area , so its a good time to buy , lots of people enter at that level and hold the stock , but when prices go lower than that , they are stuck at that point … All of them are wishing that they recover there cost . So when next time prices go near 100 , there is lot of selling pressure from people who were stuck in the stock . That the reason why a strong support area will become strong resistance area later .. because more stronger it is , more people will be stuck there . Suppose there is a stock A which has reach a low of Rs 30- this is the support level.Suppose if this broke at sometime and the stock reached a low of Rs 25 then this will be the new support level but why will it be the resistance for next time? You are correct when you say , buying and selling like this is more useful for traders, but even investors can use this basic knowledge to buy there stocks for long term , atleast they will know If waiting for some more time before buying or selling can bring them some rewards . knowledge of support and resistance is very easy and can be used by anyone , So ts worth knowing how a long-medium term investor can use it for there investing . At the end a person has to decide if it works with their personality or not !! . I think CHAMBLFERT has broken its resistance and is now on an upward trend. Its resistance around Rs43 has been broken.Its support initially was around 33.5 when I analyze the lows. Question for you: Buying and selling like this is more useful for traders. If I want to go long term are there any other specifics I should know?